Requiang Glacier, Tibet is just east of Shishapangma Mountain one of planets 14 8000 meter peaks and terminates in the rapidly expanding Kong Tso (lake) at 5200 meters. 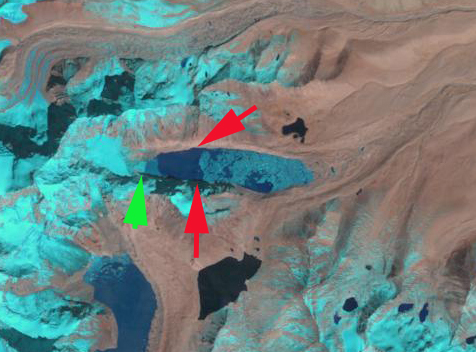 The glacier is fed by avalanching from the high slope of Molamenqing the eastern satellite peak of Shishapangma, the black outline is the boundary of the glacier’s watershed. The glacier has been undergoing a rapid retreat since 1977. 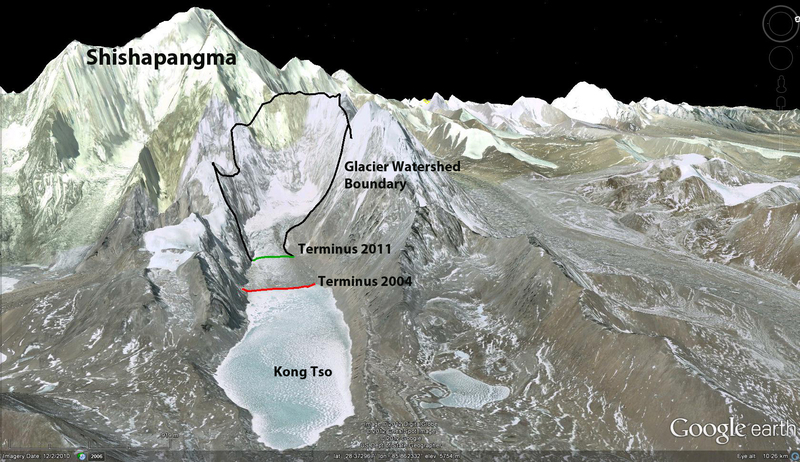 The area of Reqiang Glacier decreased by 22.90 % and retreated 71 m/year from 1977-2003 (Che et al., 2005). A comparison of Landsat imagery from 2000, Google Earth Imagery from 2004 and Landsat imagery from 2009 and 2011 indicates a more rapid retreat has ensued of 300 meters from 2000-2004, 75 m/ year, similar to the 1977-2003 period. From 2004 to 2011 the glacier retreated 1300 meters, 185 m/year. The net retreat of 3100 meters since 1977 is close to 50% of the glacier length lost since 1977. 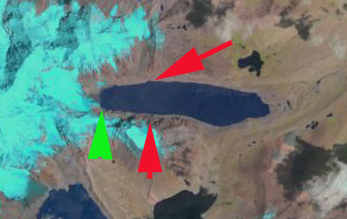 The red arrows are just west of two ridges and point to the 2004 terminus. 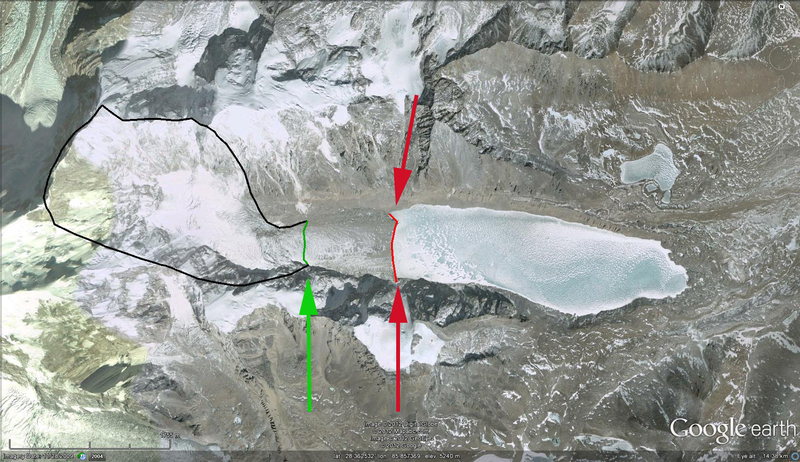 The 2000 terminus is right near the ridges, red line, the 2011 terminus at the green arrow and green line This story fits with the behavior of other glaciers in the area. For example Menlung Glacier, Tibet and Their Kang, Bhutan. In Li et al (2011) it is noted that increasing temperature, especially at altitude, the fronts of 32 glaciers have retreated, mass losses of 10 glaciers have been considerable, glacial lakes in six regions have expanded and melt water discharge of four basins has also increased. An inventory of 308 glaciers in the Nam Co Basin, Tibet, noted an increased loss of area for the 2001-2009 period, 6% area loss (Bolch et al., 2010). 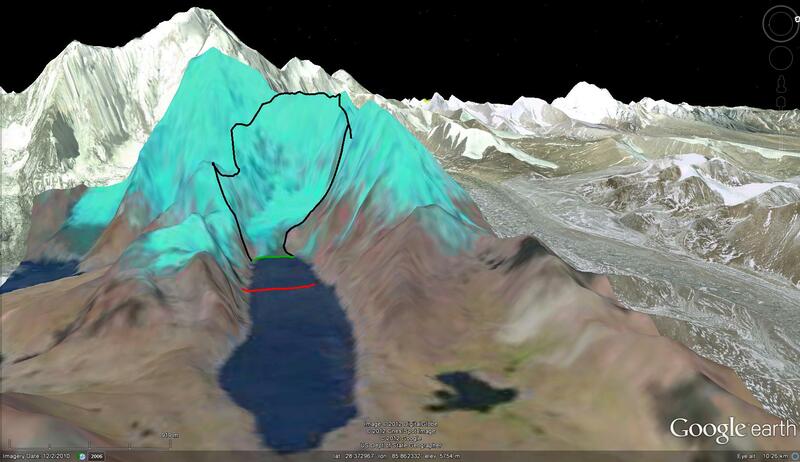 A look at the Reqiang Glacier with the 2011 Landsat Image superimposed and georeferenced in Google Earth, indicates how small the glacier is versus Kong Tso and its previous size. 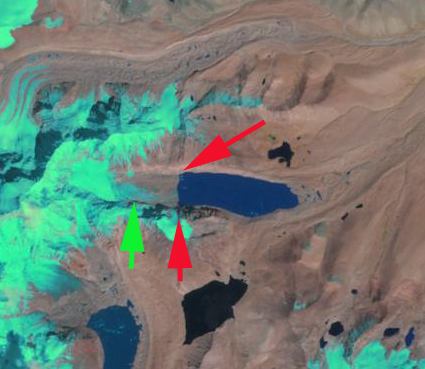 Given the access to high elevation avalanching, this glacier seems unlikely to disappear; however, its retreat is indicative of warming even at higher elevations.